WASHINGTON D.C. -- President Donald Trump spared his ally former Sheriff Joe Arpaio a possible jail sentence on Friday by pardoning his conviction, reversing what critics saw as a long-awaited comeuppance for a lawman who escaped accountability for headline-grabbing tactics during most of his 24 years as metropolitan Phoenix's top law enforcer. The White House said the 85-year-old ex-sheriff was a "worthy candidate" for a presidential pardon. "Throughout his time as Sheriff, Arpaio continued his life's work of protecting the public from the scourges of crime and illegal immigration," the White House statement said. The announcement to pardon Arpaio came three days after a rally in Phoenix at which the president signaled his willingness to absolve the misdemeanor contempt-of-court conviction. It was Trump's first pardon as president. "So was Sheriff Joe was convicted for doing his job?" Trump asked supporters at Tuesday's rally. "I'll make a prediction. I think he's going to be just fine, OK."
The pardon marked a devastating defeat for critics who believed the lawman sowed divisions by making hundreds of arrests in crackdowns that separated immigrant families and promoted a culture of cruelty by housing inmates in outdoor tents during triple-digit heat and forcing them to wear pink underwear. They say it removed the last chance at holding Arpaio legally accountable for what they say is a long history of misconduct, including a 2013 civil verdict in which the sheriff's officers were found to have racially profiled Latinos in his immigration patrols. Arpaio was accused of prolonging the patrols for 17 months after a judge had ordered them stopped so that he could promote his immigration enforcement efforts in a bid to boost his ultimately successful 2012 re-election campaign. The decision to ignore the 2011 order is believed to have contributed to Arpaio's 2016 loss to little-known retired Phoenix police Sgt. Paul Penzone. Arpaio acknowledged extending the patrols, but insisted it wasn't intentional, blaming one of his former attorneys for not properly explaining the importance of the court order and brushing off the conviction as a "petty crime." He accused then-President Barack Obama of trying to influence the 2016 sheriff's race by announcing in court weeks before Election Day that it was willing to prosecute Arpaio. But the charge itself wasn't filed by prosecutors. It was recommended by the judge who presided over the profiling case and was filed by another judge, who later found Arpaio guilty of the charge. Lawyers in Trump's Justice Department prosecuted the case at a five-day trial in late June and early July. The TV interviews and news releases that media-savvy lawman used over the years to help promote his immigration crackdowns and win re-election came back to bite him when the judge who found him guilty cited comments the sheriff made about keeping up the patrols, even though he knew he wasn't allowed. The criminal case sprang from the profiling lawsuit that ultimately discredited Arpaio's immigration patrols and is expected to cost taxpayers $92 million by next summer. Arpaio's office was accused in other instances of wrongdoing in the profiling case, though none led to criminal charges. His office acknowledged throwing away or shredding some traffic-stop records during immigration patrols. The sheriff was accused ordering some immigration patrols not based on reports of crime but rather on letters from Arizonans who complained about people with dark skin congregating in an area or speaking Spanish. And Arpaio was accused of investigating the judge who presided over the profiling case - an allegation he vigorously denied. The alliance between Trump and Arpaio centers heavily on immigration enforcement, such as getting local police officers to take part in immigration enforcement. They also have questioned the authenticity of Obama's birth certificate and have a similar history in sparring with judges. The pardon contradicts a key theme in the movement for tougher immigration enforcement - that all people, no matter who they are, aren't above the law. Arizona politicians have invoked the "rule of law" for more than a decade as the guiding principle in pushing for tougher immigration laws. During the presidential campaign, Arpaio showered Trump with support. 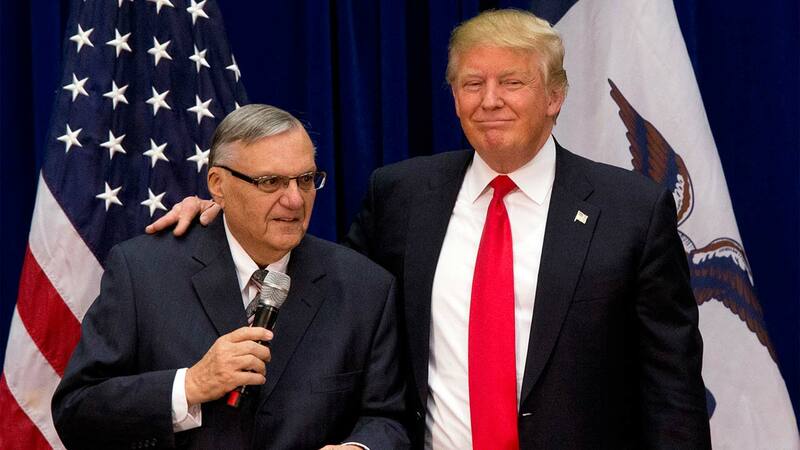 Trump, meanwhile, has invoked Arpaio's name in his calls for tougher immigration enforcement and used some of the same immigration rhetoric and advocated for tactics that made the former Arizona lawman a national name a decade earlier. He appeared for Trump at rallies in Iowa, Nevada and Arizona, including a huge gathering in the affluent Phoenix suburb where the sheriff lives. Arpaio also gave a speech at the Republican National Convention in which he said Trump would prevent immigrants from sneaking into the country. Trump issued the pardon seven months after taking office, though it is not unprecedented for a president to issue a pardon in their first year in office. The most recent president to issue a pardon so early in his term was George H. W. Bush, who granted clemency after seven months as president, said Jeffrey Crouch, a professor of politics at American University who has written a book on presidential pardons. "Given how long it took Bill Clinton (a year and ten months), and George W. Bush and Barack Obama (about two years each), waiting a while before using clemency has become the modern practice," Crouch said. Earlier in his career, Arpaio had skirted two federal investigations into his misspending of $100 million in jail funds and failed criminal investigations of political enemies. Neither investigation led to charges against the sheriff or his employees. Arpaio is scheduled to make a stop in Fresno as a guest of the Fresno County Republican Party.